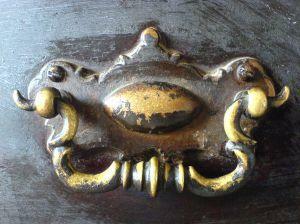 Look for antique furniture with original hardware. When it comes to antique furniture, hardware that is complete and true to the piece, style and period adds significantly to its beauty and monetary value. Although many pieces of antique furniture have survived through the centuries, unfortunately a great number of them are missing some or all of their original hardware. Sometimes a collector may come across a lovely piece that appears to have all of its drawer pulls, hinges, keyhole escutcheons or other hardware intact. However, further investigation shows the hardware is not an appropriate match to the piece. These situations are common occurrences for antique collectors, restorers and store owners. It is important for those interested in antique furniture to be aware of the types and styles of hardware used on a specific piece including the material and design. It is also helpful to know where to find original and high quality reproduction hardware for antique furniture. There are several types of businesses that carry, and often specialize in, original hardware for antique furniture. These include architectural artifact companies, antique hardware shops and some antique stores. The following are several of these suppliers that have a brick and mortar location as well as an online presence. Toledo Architectural Artifacts carries approximately 20,000 pieces of vintage and antique hardware. Located in Lancaster County, Pennsylvania, Bob Roth's Antique Hardware has a large inventory of antique hardware for furniture, doors, windows and cabinets. Robinson's Antiques carries original antique hardware dating from 1680 to 1925. Mowery Antiques specializes in restored antique hardware for furniture and houses. Eugenia's Antique Hardware and Accessories is located in Chamblee, Georgia. In the past, finding original hardware for antique furniture has often been challenging and frustrating experience. However, today there are many excellent suppliers of high quality reproduction hardware pieces where each item is accurately crafted in every detail as they were in earlier times. Whitechapel Ltd. provides an extensive selection of antique furniture restoration and reproduction hardware and fittings. Their restoration hardware is hand crafted using the Lost Wax method of casting. These exquisite pieces are made in old brass and are completely accurate in every detail including a patina that is 200 years old. Their reproduction hardware is offered in antique or polished brass. House of Antique Hardware carries beautiful reproduction hardware for antique furniture form the Victorian era through the early American styles including Federalism and Colonialism. In addition to hardware made of brass and iron, the company also carries glass and wooden pulls and knobs. There are many different types of hardware for antique furniture pieces. The following lists the names of the hardware commonly used for a specific piece of furniture or furniture part. Having the correct original or high quality reproduction antique furniture hardware impacts the value of the piece.